« Say you plan to roll a die 20 times. Which of these results is more likely: (a) 11111111111111111111, or (b) 66234441536125563152? Each expression except one evaluates correctly to the respective hour. Can you find the erroneous hour? SPOILER ALERT! I posted the answer to the puzzle in the comment section of this post here. This entry was posted on December 2, 2012 at 11:29 am and is filed under Life with tags 5, 601.3952191, 9, clock, error, factorial, math, mistake, o'clock, square root. You can follow any responses to this entry through the RSS 2.0 feed. You can leave a response, or trackback from your own site. 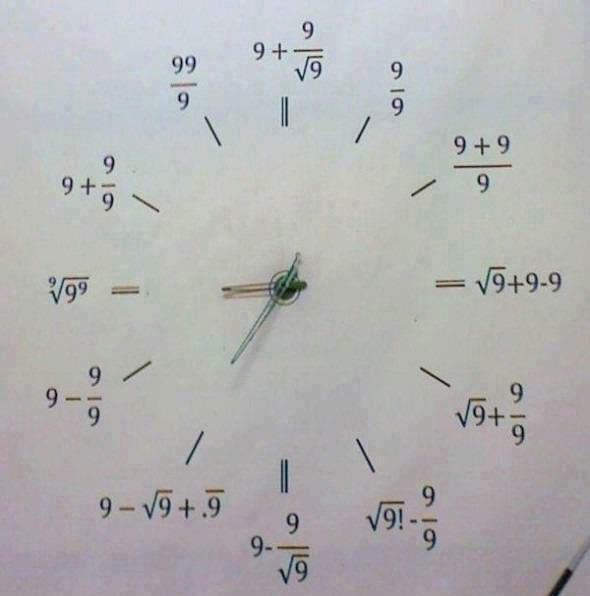 As expressed, what should be 5 o’clock actually evaluates out to be 601.3952191, because the factorial (!) is under the square-root. Sorry, I can’t do the symbols you experts do but why not the square root of 9 + 9+9/2 ??? Gee, now I see how easy it was for the original clock maker to make a slight bobble. Oops! Sorry about that Abs! But you gave me a great idea to “hide” the answer in the comments. I’ll do this now.